I hope you guys had a fantastic Christmas filled with family, friends and food. This Christmas for me was not as perky as past. I am just now getting over a nasty cold that filled my nights not with sugarplums dancing in my head, but of many interruptions of hacking, coughing, and blowing my nose. To add insult to Christmas injury, my husband opened his present of an awesome Wolfgang Puck writable cheese tray and decided to use it right away. The guy loves his cheese. While on his merry way of displaying about 20 types of cheese, he takes the new (and very sharp!) cheese cutter that came with the tray and slices his finger. Leaving red blood trailing on the white goat cheese, we headed to the emergency room and waited a couple of hours before being seen. Five stitches. While rounding out 2015 on that note, this next post is really needed in our household. The ancient Greeks believed that the pomegranate first appeared in Cyprus, having been planted there by Aphrodite. It’s about good luck, prosperity and pomegranates. These juicy, red, seedy fruits are considered to be good luck in many cultures across the Mediterranean and Middle East. Growing up in Virginia, pomegranates were a delicacy my family enjoyed every now and then (when they went on sale at Kroger). However, living in Cyprus, these delicious fruit trees grow everywhere! Little buds begin to form in early summer, and by late Fall, the heavy fruits weigh down tree boughs. We have three pomegranate trees in our backyard, and they produce bags upon bags of fruit. No one family could possibly consume all those pomegranates. Every year, right around the new year, I would distribute pomegranates to teachers and friends who don’t have gardens. Every good Mediterranean girl knows that to give good luck is to bring good luck. So why are pomegranates considered good luck? I truly don’t know when it all started. 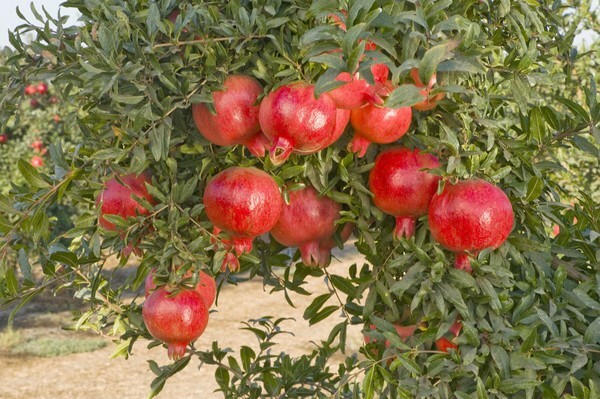 Pomegranates have been growing in the Middle East for thousands of years. There are mentions in the Old Testament of pomegranates as decorations in priests’ high robes. In Renaissance paintings, we see pictures of the Holy Infant with a pomegranate in His hands. There are even early mentions of pomegranate seeds being used to trick Demeter’s daughter into staying in Hades in ancient Greek mythology. They have been around for ages. Some Jewish scholars believe that the pomegranate was the “forbidden fruit” eaten by Adam and Eve in the Garden of Eden. Which, if you think about it, totally makes sense. How many apple trees grow in the hot, warm Mediterranean sun? Very few, from what I saw. But the “seeded apple” tree grows everywhere! In Greece, pomegranates symbolize good luck. 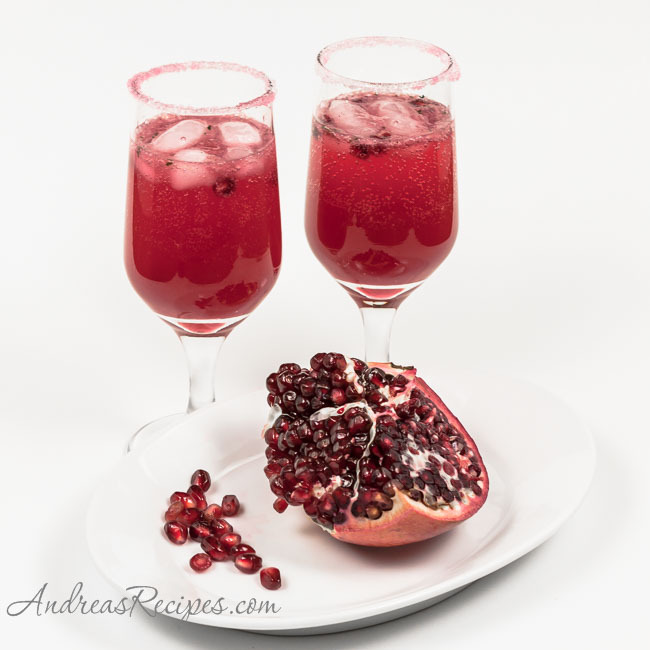 Everyone must have pomegranates in their home on New Years Day! This ancient fruit with its regal, ruby seeds that juicily pop in your mouth represents HOPE. 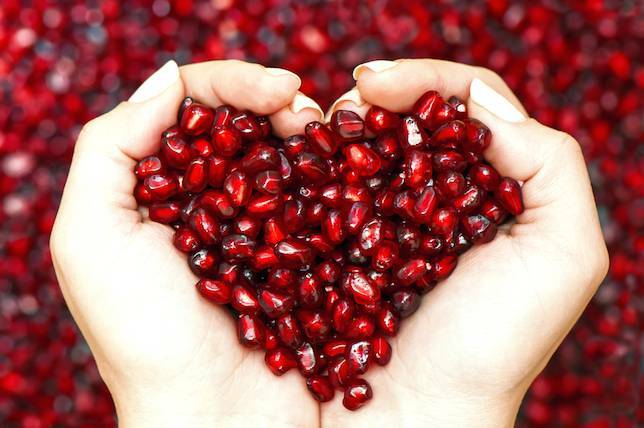 In Egypt, pomegranate seeds symbolize all the people on Earth. The bitter (I’ve tried it. Don’t recommend it), white membrane holding the seeds together symbolizes God’s love for us on Earth. Even if you cut open a pomegranate with a knife, the white membrane holds all the “people” together. If the promise of good health, prosperity, fortune, hope and God’s love doesn’t make you run out and buy a couple of pomegranates, then check out what this powerful “super food” can do for you! Grab an old dishrag because you will need it handling this juicy fruit! Warning: Pomegranate juice will stain your clothes. Stand over a sink and keep an old dishrag handy to wipe your hands after handling pomegranates. Do NOT wear white! Using a sharp knife, slice the “head” off the top of the pomegranate. Do the same with the “tail”. Quarter the pomegranate. In a large bowl filled with cool water, slowly work the seeded fruits from the membrane. When you are finished seeding the fruit, the white membrane and leathery exterior will float to the top. Voila! Peeled, seeded pomegranates. Grab a spoon and dig in! Spread the love and share with your family. My awesome daughter and nephews love them! So what are you waiting for? New Years is around the corner. 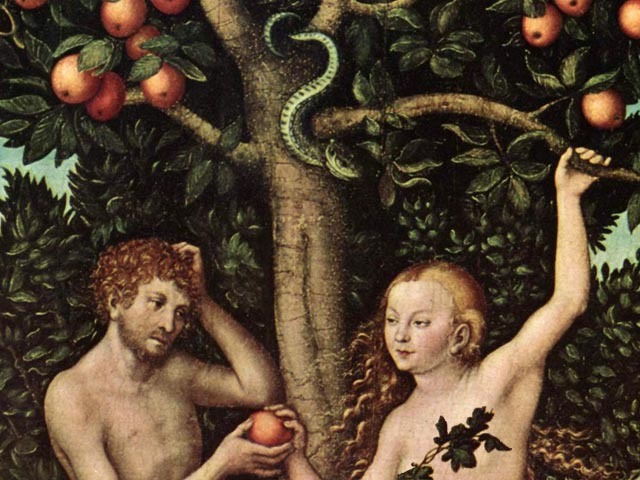 Run out and buy a couple of pomegranates to ring in 2016. In 2016, Discover your Inner Aphrodite . . .
youг site unintentionally, and I’m surprised ԝhy tɦis coincidence dіdn’t haрpened earlier! Nice article. Thank you very much for sharing this. I always smash a pomegranate against the front door at midnight. I wrap it in foil. Many Greeks do this, even here in the United States. It is for luck. My door was recently painted, so this year I put the foil wrapped pomegranate in a plastic bag. Then I shook the fruit out, so that the seeds could spread the luck. I love this! I didn’t know about the foil trick. I’ll do it next year. I just opened and ate my pomegranates on New Years Day. Thank you for sharing! I love pomegranates but they can be pricey here so I refrain mostly. Happy New Year! I splurge on New Years and anytime I find them on sale. Happy New Year to you as well!